This article is about a former Interstate numbered 170. For the Maryland state highway with the same number, see Maryland Route 170. US 40 at MLK Blvd. Interstate 170 (I-170) was the designation for a 1.39-mile (2.24 km) freeway in Baltimore, Maryland, that currently carries US 40. The highway was originally envisioned as the eastern terminus of the Maryland portion of Interstate 70, a major transcontinental route, and was later envisioned as a direct link between the Interstate and the western edge of the central business district of Baltimore. However, with the loss of Interstate 70 in Baltimore, the route was deleted as an Interstate. Disapproval of the remaining depressed highway by Baltimore citizens, as well as environmental groups, has earned it the common nicknames of "The Highway to Nowhere" and "The Ditch"; in addition, other names include the "Westside Freeway" and the "Franklin–Mulberry Expressway", both referring to its location in the city. The western end of the freeway stub in Baltimore City intended for use by the canceled I-170. This freeway is now used by US 40. I-170 would have begun at a directional-T interchange with I-70 where Baltimore Street and Amtrak's Northeast Corridor cross Gwynns Falls. The Interstate would have paralleled the north side of the railroad tracks through what is presently an industrial area. I-170 would have crossed Mulberry Street (eastbound US 40) and veered east through what are now parking lots for the West Baltimore station on MARC's Penn Line to seamlessly connect with the portion of I-170 that was constructed east of Pulaski Street. The unconstructed freeway would have had an eastbound exit ramp to Mulberry Street and a westbound entrance ramp from Franklin Street. These ramps, which were partially constructed when the highway was built and torn down in 2010, would have connected US 1 with I-170 in the direction of I-70. The ramps from Mulberry Street and to Franklin Street to connect with the portion of I-170 that was completed are now part of US 40. The ramps merge with the uncompleted freeway under Fulton Avenue (northbound US 1). Originally beginning and ending at Pulaski Street, these ramps have since been truncated to a now-continuous Payson Street. US 40 heads east as a six-lane freeway in a cut between Mulberry Street and Franklin Street. Along the way, it passes under eight roadway bridges and two pedestrian bridges (Stricker Street and Carrollton Avenue). East of the Schroeder Street underpass, the freeway reduces to four lanes at the eastbound ramp to Mulberry Street and the westbound ramp from Franklin Street, which connect the freeway with Martin Luther King Jr. Boulevard. After US 40 passes over the boulevard, the freeway ends by merging with Mulberry Street and Franklin Street just west of their intersections with Greene Street, which heads south as MD 295. Under the proposed routing of the Interstate Highways through Baltimore, Interstate 70 would have been routed through West Baltimore to join Interstate 95, and Interstate 170 would have been a spur from Interstate 70 into central Baltimore. However, the spur was left stranded from the rest of the Interstate Highway System by the cancellation of Interstate 70 within the city limits of Baltimore. Several proposals were made during the 1940s and 1950s for an East–West Expressway through Baltimore. After nine different proposals were floated, in 1960 the city's Department of Planning published a proposal of its own. The route in the proposal (then designated as I-70N) would have begun in the western edge of the city, passing through Leakin Park and Gwynns Falls Park. It would have then curved south in the direction of Edmondson Avenue, then turned east and followed the Franklin St.-Mulberry St. corridor. It would have then curved south into the Pratt St. corridor and crossed the city to the north of the Inner Harbor on an elevated viaduct within the central business district, junctioning I-83 and I-95 in the southeast edge of the CBD. This routing was eventually further refined and modified and eventually became part of the Baltimore 10-D Interstate System, approved in 1962. 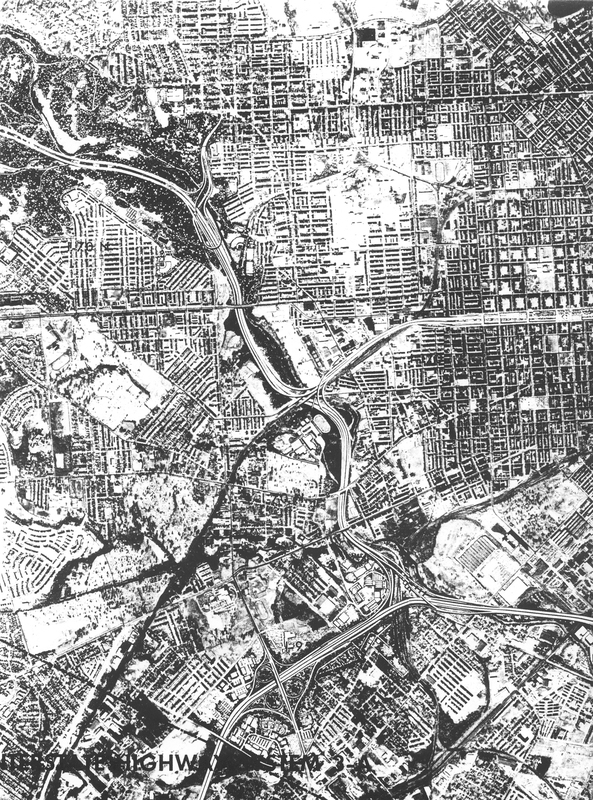 By 1969, the Design Concept Team, a multi-discipline group assembled in 1966 by the city government to help design freeway routings that would not disrupt the city's fabric, had replaced the 10-D System with the Baltimore 3-A Interstate and Boulevard System. In the 3-A system, I-170 was brought into existence, and was planned as a freeway spur from I-70 (which would continue south toward the current alignment of I-95) through the Franklin St.-Mulberry St. corridor formerly followed by the East–West Expressway to the west edge of the central business district, connecting to a new route named Harbor City Boulevard (now known as Martin Luther King Jr. Boulevard). Besides ending at the western edge of the central business district, I-170 would also run further south than the original East-West Expressway proposal. The 3-A System's result was that I-170 would provide direct access to the central business district. Curiously, I-170's three-way semi-directional interchange with I-70 was planned to be partially integrated with I-70's interchange with Hilton Parkway; diagrams of the interchange show that the ramp from eastbound I-70 to eastbound I-170 would have diverged within the latter interchange and run alongside I-70's eastbound carriageway to the western terminus of I-170, where it would diverge. Construction began on I-170 in 1975 and was finished in 1979. The completed section runs mainly below street level, rising above it at the eastern end; the same was also true for the western end until it was leveled in late 2010. The wide median space was originally reserved for a once-proposed branch of the Baltimore Metro Subway system; this rail line was never built, and more recent plans for the Red Line, a proposed light rail corridor that would have been built by 2016 but was cancelled the previous year, made use of the median. I-170's future was left in doubt after extended protest from environmental groups led to the cancellation of the segment of Interstate 70 between Security Boulevard (Exit 94) and I-170 (scrapped Exit 96) on September 3, 1981. As a result of this cancellation, it was proposed to connect the existing I-170 to I-95 via the southern portion of the original proposed I-70 expansion, with the entire spur redesignated Interstate 595; however, this segment was canceled on July 22, 1983 in the face of further opposition. "Interstate 595" was later assigned to a different highway in Maryland (it now exists as an unsigned name for US 50 between the Capital Beltway and Annapolis). With I-170's connection to the Interstate system removed, it was promptly deleted. US 40 was rerouted onto the stub freeway in its place. Various proposals for the isolated highway stub have been floated: in addition to the proposed use of its public transit right of way, it has also been suggested that the road be dismantled, with land filled for new homes to replace the ones that had been demolished for the freeway's construction. In 2010, demolition work began on the structures at the western edge of the highway that had been intended to link to the wider Interstate system and had never been used by automobiles, including the ramps to and from Monroe Street (southbound US 1); by 2012, these were replaced by green space and an expanded parking lot for the nearby West Baltimore MARC Station, and Payson Street was made continuous between Mulberry and Franklin Streets; as a result, the freeway ends at Payson instead of Pulaski. The remaining section of the highway was still key to the Red Line project that was cancelled in 2015. 1.45 US 1 (North Monroe Street / North Fulton Avenue) to US 40 US 40 originally followed Franklin Street (westbound) and Mulberry Street (eastbound). ^ Staff (December 31, 2005). "Highway Location Reference: Baltimore City" (PDF). Maryland State Highway Administration. ^ Weingroff, Richard. "Why Does I-70 End in Cove Fort, Utah?". Ask the Rambler. Highway History. Federal Highway Administration. Retrieved January 21, 2007. ^ Shen, Fern (September 24, 2010). "Highway to Nowhere Coming Down? Not Really". Baltimore Brew. Retrieved September 19, 2011. ^ "'Highway To Nowhere' Demolition Begins". Baltimore: WBAL-TV. September 10, 2010. Retrieved September 28, 2010. ^ Dresser, Michael (June 25, 2015). "Hogan Says No to Red Line, Yes to Purple". Baltimore Sun. Retrieved April 12, 2016. Wikimedia Commons has media related to Interstate 170 (Maryland). This page was last edited on 18 February 2019, at 02:26 (UTC).